Think Burrus Blog: Foliar fungicide on corn in 2016: why, when, and did it pay? Foliar fungicide on corn in 2016: why, when, and did it pay? After pollination, the corn yield potential is set. We can't add to the corn yield potential, but we can try to preserve it! Think of the corn leaves (especially the top leaves) as factories for photosynthesis and their job is to make sugars for plant growth, development and grain yield. If there is leaf loss or stress at tassel or during grain fill, the corn plant may have a reduction in yield potential. In 2016, when we scouted at tassel, disease did not appear critical, especially in areas where it had been dry in June. But later during grain fill, after massive amounts of rain, diseases such as gray leaf spot and southern rust (in the south) came in full force, especially if susceptible hybrids were planted within heavy residue. A fungicide application may have been warranted on susceptible hybrids between the corn growth stages of tassel and brown silk. In some cases, fungicide could have been applied before dent if warranted, to try to preserve corn yield, but in these tight economic times, this was risky. It has been well documented that the higher percentage disease on the plant, the greater the yield loss. Leaf disease can also be indirectly correlated to the development of stalk rot. 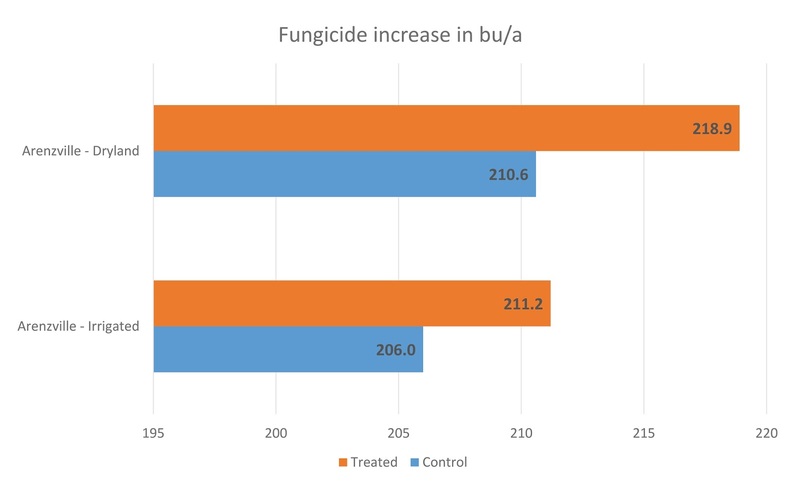 Research has also shown that if there is high disease pressure present and fungicides are applied at the right time, there is a greater potential for a yield response from a fungicide, which can increase your return on investment. On April 8 and 23, 2016, fungicide trials labeled as dryland and irrigated were planted into fields that had been corn planted after corn near Arenzville, IL by the Burrus research team. The dryland study consisted of four replications and the irrigated study consisted of three replications of 14 hybrids, which were either treated or a control. On June 30, 2016, a 14 oz. rate of Headline AMP® fungicide was applied to treated hybrids and no fungicide was applied to the control hybrids. Even though it was dry in June, before pollination, the dryland study appeared to have very good disease pressure later in the season, due to rain and river bottom environment. There was also a distinct visual difference between the treated and control hybrids. Hybrids that received a fungicide application appeared to stay green and have overall better health. On average, this fungicide application added a 5 to 9 bu/a increase depending on hybrid and location. 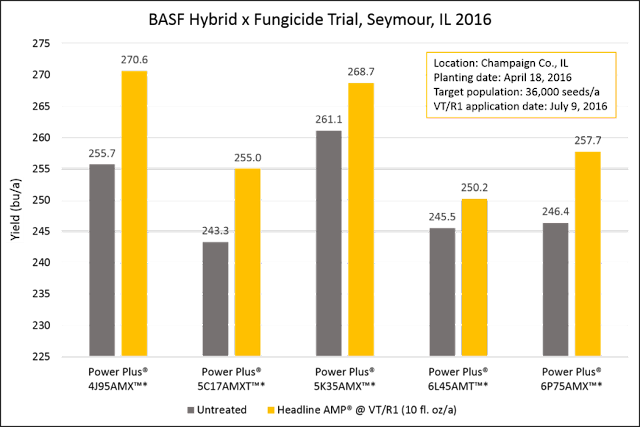 On the other side of the state, The BASF Midwest Research Farm (Seymour, IL) conducted a hybrid x fungicide trial in 2016 that included 53 hybrids from 8 different seed companies in a field that was third year corn. Similar trials were conducted in 2014 and 2015. The trial was planted April 18th and received adequate rainfall throughout the growing season. 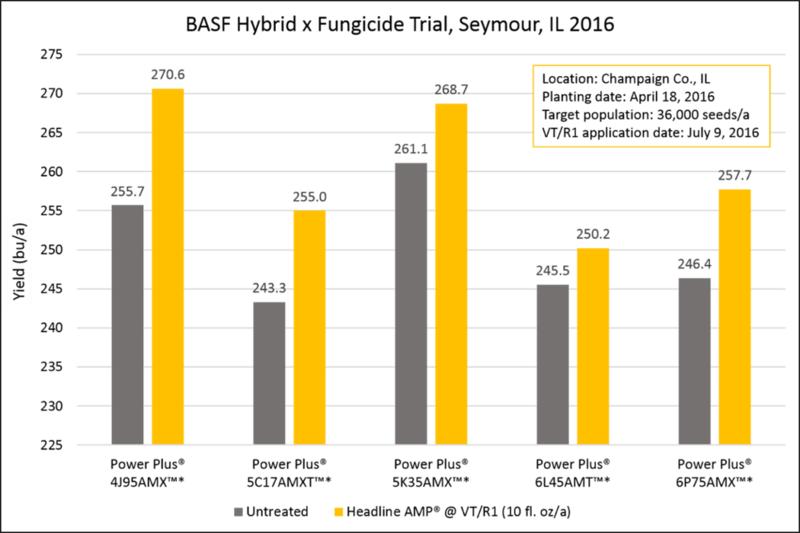 Foliar disease pressure was relatively low, but the application of Headline AMP (10 fl oz/A) fungicide at (VT/R1) resulted in improved growth efficiency and stress tolerance (ie., late season stalk integrity, stay green, and extended grainfill). 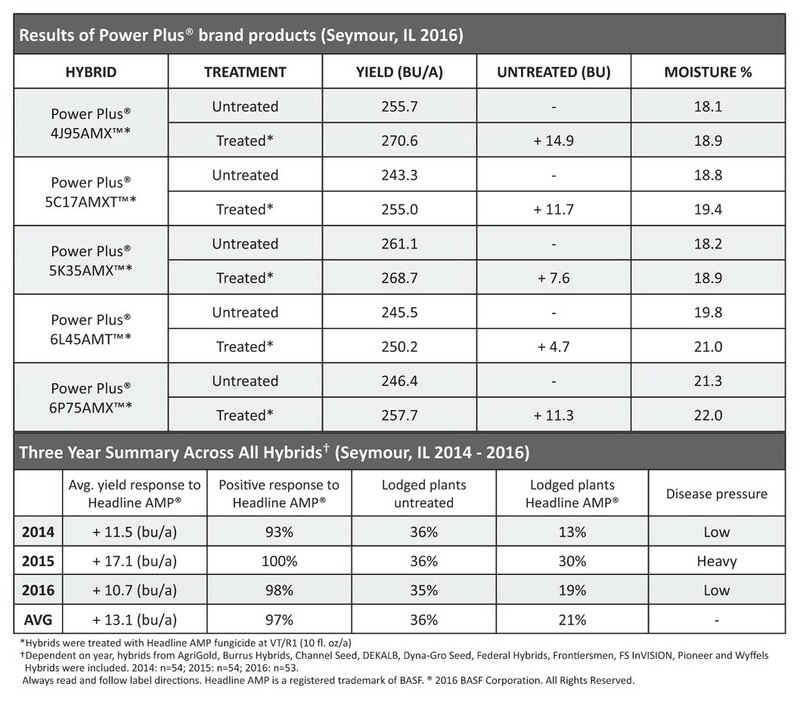 The average Headline AMP® fungicide yield advantage of the Burrus hybrids was 10 bu/A and the average yield response of all hybrids was 10.7 bu/A. Fungicides can range in price from $16 to $31 per acre which includes fungicide, airplane application, and adjuvants. So, 2016 was a year when a fungicide application could have given a return on investment as well as improve overall plant health and standability. Remember in some situations, you may want to factor in the cost of increased moisture.